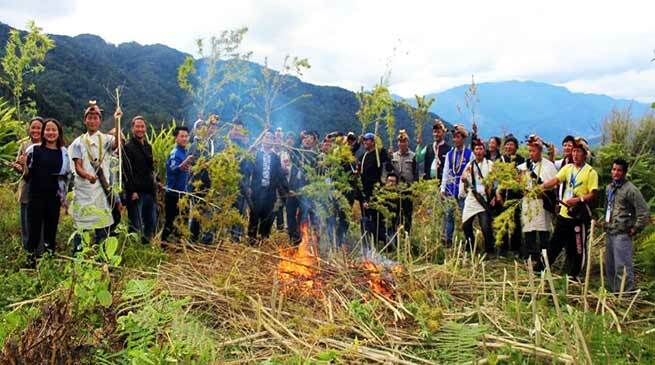 Villagers declared Jajing Tapo village as Dry village, burn down 8 bags dry Cannabis (ganja), destroy large area containing Cannabis cultivation. The Villagers and believers of Jajing Tapo Baptist Church Range under Nyishi Baptist Church Council (NBCC) of Mengio Circle in Papum Pare district declared the Jajing Tapo village as Dry village. The Anti Liquor Movements taken up by the NBCC and the villagers give full pledged cooperation. As sign of the movement around 8 bags of dry Cannabis (ganja) was burned down as a symbol while a team led by local youth leader and APCC General Secretary Gyamar Tana destroy and cut down more than 27 field containing Cannabis (ganja) cultivation. More than 100 local resident and villagers signed themselves a pledge not to encourage rather discourage cultivation of such drug/plant which affect the health and destroy the happy family. Gyamar Tana informs that Arunachal Baptist Church Council (ABCC) Rev. (Dr.) General Secretary Changha Chippo and Nyishi Baptist Church Council (NBCC) General Secretary Rev. Tar Choya attended the celebration as the Speaker and the Special Guest. NBCC Gospel artistes led the praise and worship and presented gospel singings and dancing during the celebration. Believers from all the churches of Mengio Pastoral Range participated in all cultural, games and sports and were blessed.